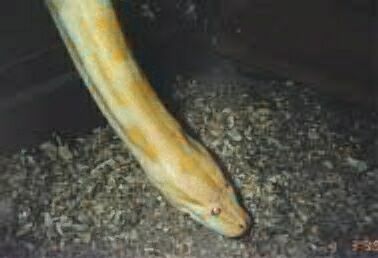 Al is an albino Burmese. He was named that way because he's albino. I got him from a lady in another city. She gave me him, and the large cage that's shown in 'Enclosures' for free. It was a great deal. Al eats 3 - 4 lb rabbits, 2 at a sitting. He's kind of a big lump, doesn't really move around much, although he's more active at night. He's a big sweetie too, and has never bitten me.